Talking about security can lead to anxiety, panic, and dread... or cool assessments, common sense and practical planning. Over the last two years we've become obsessed with security, and put in place a whole host of policies and procedures that will do... exactly what? In his latest book, Beyond Fear , security expert Bruce Schneier explains how security really works. The key is to think of security not in absolutes, but in terms of sensible trade-offs, whether on a personal or global scale. Schneier's practical approach to problem-solving is a refreshing antidote to today's doomsday pessimism and anxiety. With the technical know-how and common sense that have made him one of the world's top security experts, Schneier shows how we can move beyond fear to start thinking sensibly and creatively about security. Does arming pilots make flying safer? Will computerized voting machines make election results more accurate? Is online shopping with credit cards especially risky? Will a national ID card better protect us from terrorism? If you read the newspapers or listen to the pundits you might answer "yes" to these questions, but the truth will surprise you. Security expert Bruce Schneier has spent his entire career figuring out how security actually works, and he explains it all in this entertaining and readable book. 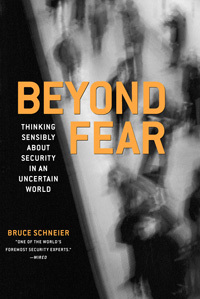 Beyond Fear goes beyond the hype, and explains how we all can think sensibly about security. In today's uncertain world, security is too important to be left to others. Drawing from his experience advising world business and political leaders, Schneier demonstrates the practical—and surprisingly simple—steps we can all take to address the real threats faced by our families, our communities, and our nation. Security is not mysterious, Bruce Schneier tells us, and contrary to popular belief, it is not hard. What is hard is separating the hype from what really matters. You already make security choices every day of your life, from what side of the street you walk on to whether you park your car under a streetlight. You do it naturally. This book guides you, step by step, through the process of making all your security choices just as natural. Schneier invites us all to move beyond fear and to start thinking sensibly about security. He tells us why security is much more than cameras, guards, and photo IDs, and why expensive gadgets and technological cure-alls often obscure the real security issues. Using anecdotes from history, science, sports, movies, and the evening news, Beyond Fear explains basic rules of thought and action that anyone can understand and, most important of all, anyone can use. The benefits of Schneier's non-alarmist, common-sense approach to analyzing security will be immediate. You'll have more confidence about the security decisions you make, and new insights into security decisions that others make on your behalf. Whether your goal is to enhance security at home, at the office, and on the road, or to participate more knowledgeably and confidently in the current debates about security in our communities and the nation at large, this book will change the way you think about security for the rest of your life.